Myth Buster…Homes DO sell during the holidays! Quite often, too often, in fact, Realtors hear home sellers say that they want to take their home off the market for the holiday season. Their concerns usually stem from the misconception that buyers are not looking during November and December because they’re halting their search for the holidays. In many cases, this is not correct. For home sellers who list in the late summer and early fall, their home can stay on the market longer than anticipated because the inventory during that time is at a high point for the year. September and October are usually the months with a very high number of homes on the market, and then as those homes sell or people begin taking them off the market, inventory decreases. These folks are still out there looking for a home and are eager and motivated to find a home by the end of the year. These buyers are very dedicated and are the most likely to make serious offers if they’re interested in your home. If you are skeptical, here are the stats from last year at this time along with this years. You can see in September 2017 (week 37) the inventory was high reaching 18,116 homes on the market. 2018’s fall spike occurred that week as well but the difference is that this year, the inventory kept increasing. 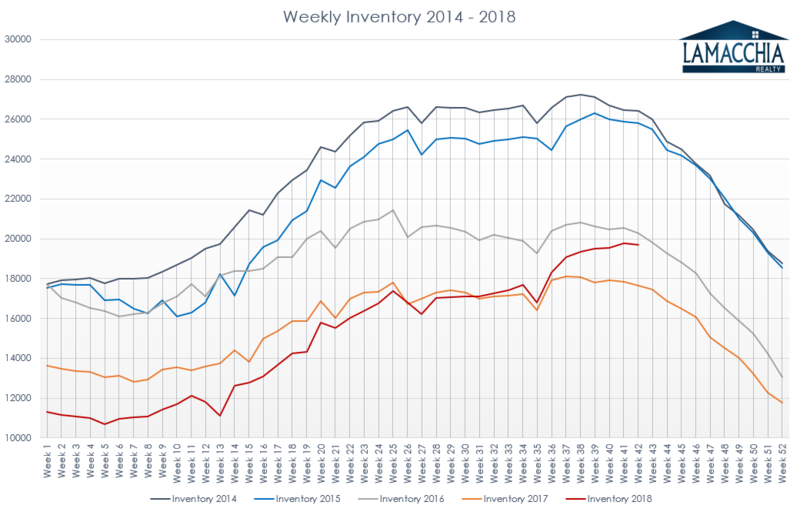 Conversely, 2017 inventory decreased every week from that point through November and December, where it goes down by 4-5% each week leading up to the end of the year. This year’s spike seems to still have some momentum, though only slightly beginning to depict a downtrend this week. 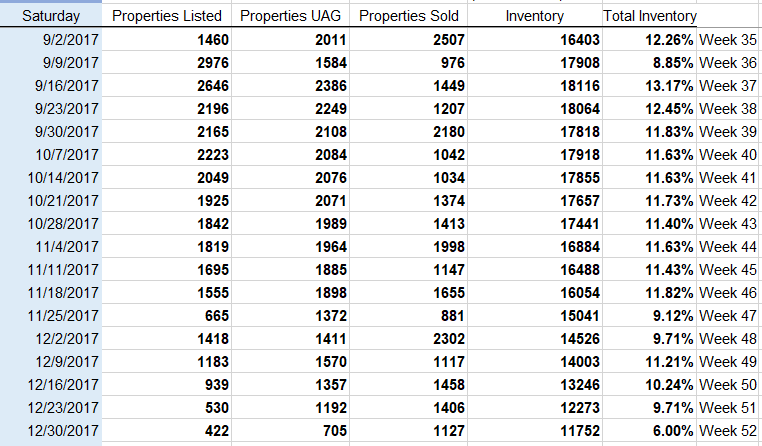 One of the many metrics we track on a weekly basis at Lamacchia Realty is the number of homes that are listed compared to the number of homes that go pending each week. It provides us and our clients with very telling data about how active the market is. Throughout November and December, there is a slight decrease in homes that are going pending (UAG), but you may be surprised at how small that decrease is. In September and October 2017 an average of 11.6% of the homes for sale went pending (under agreement) every week. Then in November and December, an average 8.8% of homes went pending. That is a decrease of only 2.8%! If we remove Thanksgiving week and the week between Christmas and New Year’s, the average goes up to 10.1% -which brings the average closer to those fall months. This means that people are buying homes before and during the holidays! This year began with substantially less inventory than last, but that changed this summer (week31) when inventory increased year over year for the first time in years! This year September’s average amount of pending sales per week was 10.44% which is 1.27% lower than the exact same period in 2017 when it was 11.72%. As inventory increases, buyers weren’t eating listed homes up as much as they have typically done in the fall. For the first time in many years, homes rested longer on the market, as buyers had more time homes from which to choose. The Buyers Still Looking in November and December Want a Home! Year after year home buyers do look for homes during the holidays. Buyers who look during that time tend to be more serious because the casual lookers tend to delay until after the holidays. Joselin’s experience is all too familiar. Buyers want a home during the holiday months, there is no better gift than the keys to a new home. The market shifts between buyers and sellers favor. We saw a period this fall where the market was more saturated with homes than buyers, as explained in our recent blog, which gave them more options and more negotiating power. In the winter, that balance shifts back into the seller’s favor, where they have the upper hand as inventory drops, and buyers have to compete for properties. Hang in there, and if you have any questions about listing in the winter, contact one of our expert agents and we can help guide you through this process!